The term “entry-level”, or “junior-level” typically refers to candidates with less than 5 years of professional experience, and includes those just starting out in their careers, as well as individuals in high school and college. For someone who is younger in their career, putting together a resume poses a unique challenge in determining just what experience and attributes should go into a document. Most of the traditional resume “formulas” don’t apply here – you often don’t have tons of accomplishments, or results-driven statements to work in, as early experience like internships are more about learning than creating impact. However, the resume should still provide a unique story around your professional and personal development, and that include a number of things. Start first with the basic sections of the resume and work from there in creating interesting content and providing details around your experience, skill sets, and accomplishments. These sections can include an introductory summary, education or training section, professional experience, volunteer work (or additional experience), membership and affiliations, and technical skills. Graduate in online marketing with experience developing, tracking, and managing campaigns across social and digital marketing channels. Well-versed in digital marketing tools including Google AdWords, SEO/SEM, Facebook, Twitter, WordPress, HootSuite, and MailChimp. Skilled at developing original content for social media, digital marketing campaigns, websites, and blogs. Passionate about furthering expertise in the technology and design fields. 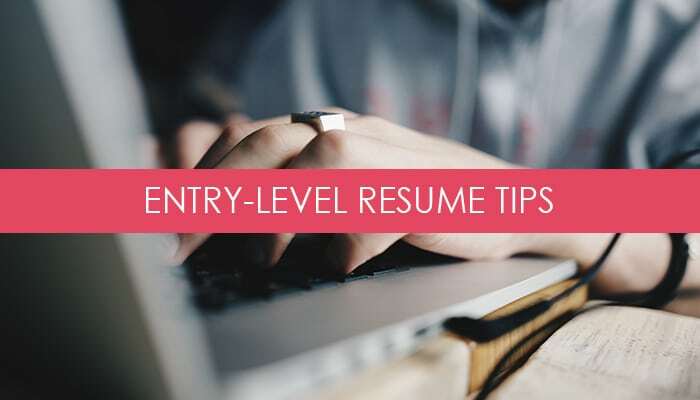 Show Potential Along With Experience: Entry level resumes aren’t just about what you’ve done because you don’t have much experience at that point. With that said, they’re also about showing potential, and you can do so by describing not only your tangible experience, but things you have done that speak to your interests and skill set – such as volunteer work, pro bono or freelance projects, or classes that you’re taking. Highlight Your Most Relevant Projects: Avoid cramming in extra or too much information. Instead, if you’ve worked on a lot of projects – whether through school, an employer, or on your own, choose a few highlights that represent your best work. The rest you can discuss in the interview, or use as examples in another context, such as the cover letter, your website, or on LinkedIn. Keep it Relevant: Outlining every detail or responsibility is also not necessary. Keep the resume concise by primarily highlighting the responsibilities and accomplishments most relevant to the company and role. As you progress through your career, consider what things might no longer be necessary – such as GPA, collegiate activities or affiliations, or coursework. Experience prior to college can generally be left off once you’re a few years into your career. You might make an exception for relevant volunteer or entrepreneurial work. Be Thoughtful About Design: Avoid unnecessary visual elements that take up space, unnecessarily large margins, excessive formatting, or too-large fonts. This is a common mistake entry-level job seekers (and many others) make to draw attention away from a lack of experience, in hopes of making the resume stand out. Unfortunately, that tactic generally does not work. Hiring managers would rather see a clean, polished resume that describes a candidate with potential, than a flashy resume with few details. Finally, be sure to update your resume regularly as you gain experience, take on new projects, acquire additional training, or refocus your career path. As you build career momentum and develop professionally, so too should your resume. Make sure that you’re always putting your best, most relevant, and most up-to-date foot forward – so that you’re providing hiring managers with an accurate picture of their next hire! Tags: resume. Bookmark the permalink. I was really confused on how to answer the question your article proved to help my confusion..